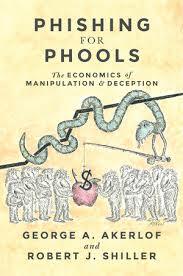 In Phishing for Phools: The Economics of Manipulation and Deception, Nobel Prize-winning economists George A. Akerlof and Robert J. Shiller critique free market dogma through an analysis of the ways that markets utilise tricks and traps in order to ‘phish’ us as ‘phools’. Although he suggests that many of the book’s insights may be familiar and at times general, Florian Bon positions Phishing for Phools as an entertaining and accessible read filled with engaging anecdotes that remind us of the capacity of markets to manipulate and deceive. If you are interested in this review, you may also like to listen to a podcast of Robert J. Shiller’s lecture at LSE, held on 11 November 2015. Phishing for Phools: The Economics of Manipulation & Deception. George A. Akerlof and Robert J. Shiller. Princeton University Press. 2015. Some of the most recent news, including Volkswagen’s fool’s game of rigging pollution tests, remind us that one should always keep in mind the key insights of Phishing for Phools. Flawed studies sponsored by Big Pharma, money politics, political action committees, Daedalean financial engineering, credit cards (or ‘magic pills’) that encourage us to buy more: numerous are the ways in which one can be phooled. Akerlof and Shiller give a detailed and highly accessible account of the short-sightedness of the free market equilibrium thesis as a putative Pareto optimal situation maximising the economic welfare of everyone. Valuable as they are, these insights will, however, hardly come as a surprise. Edward Bernays, the nephew of Sigmund Freud and advisor to the American Tobacco Company amongst others, explained in Crystallizing Public Opinion (1923) how corporations and governments could shape public attitudes, using the psychoanalytic findings of his uncle and Gustave Le Bon’s ideas on crowd psychology. In 1867, in Das Kapital, Karl Marx placed emphasis on the substitution of the Weberian so-called ‘salutary function’ of ideologies by what he named the ‘fetishism of commodities’: an analysis that prefigured post-modern marketing techniques. In Mythologies (1957), Roland Barthes described the transcendental nature of day-to-day objects, which function as spiritual abstractions in a century where ‘God is dead’ (Friedrich Nietzsche). According to Barthes, consumption has replaced religion; since then, corporations have had a free hand to phish. Furthermore, the psychological bias arising from the ‘stories we tell ourselves’ has already been convincingly tackled by John Maynard Keynes. A century ago, in his Treatise on Probabilities (1921), the great economist underlined the fact that people handle complexity through narratives and tailored stories. Finally, Milton Friedman’s idea that free markets maximise peoples’ utility function by letting them be ‘free to choose’ has been questioned. Free will no longer seems to be the bedrock of individualism as Social Psychology has been accumulating evidence of the power of imitation (see Ap Dijksterhuis’s chapter, ‘Why We Are Social Animals’). The authors themselves recognise this. The true quality of the book lies in the fact that it acts as a reminder of the deception mechanisms at play in our daily lives. However, the demonstration of this faces three major pitfalls. The first is that Akerlof and Shiller cover an extremely broad range of topics, which often prevents them from delving into details. The first part of the book is thus very simple, if not oversimplified. Part One is devoted to the subprime crisis with a more specific focus on the role of credit-rating agencies. One could wonder about the decision to consecrate such a large chunk of the book to an over-tackled subject. This reasoning could also be applied to the chapter on money politics and the impact of lobbyists in Washington. When Akerlof and Shiller do dive into details, especially in the chapter dedicated to Michael Milken’s junk bonds and the US Savings and Loan crisis of 1986-95, Phishing for Phools gets all the more captivating, whilst concurrently becoming more of a history book than an economics book. The second pitfall is that Phishing for Phools quite often generalises notions. The authors classify human beings, whatever their awareness or brainpower may be, into two distinct categories of phools: psychological and informational phools. One could argue that it might be trickier to phool and sell junk mortgage-backed securities to a Nobel Prize winner in economics than to a student majoring in archaeology. Furthermore, as Chris Anderson demonstrates in Free: The Future of a Radical Price (2009), new business models – for instance, Spotify or the freemium-based game League of Legends – have emerged in which the phoolishness of a tiny minority (2/3%) is subsidising the vast majority of the customers. Things are not as simple. There is also no mention of the most recent technological changes. In the age of the industrial internet, scattered with so-called big data, the possibilities for phishing seem to have a decreasing marginal yield. Technological breakthroughs bring consumer awareness via peer review and open data. The business model of highly-valued companies such as Airbnb, Uber, Booking.com or TripAdvisor is based on the ability of consumers to rate the services they have received. In a world in which every service is graded, asymmetric information and moral hazard are considerably diminished. You will never again be caught in a grubby, overpriced hotel if you know that its average review mark from a panel of 567 former clients is 2.5 out of 10. Recognising that ‘we need protections against the problems’, Akerlof and Shiller do not, however, provide any heuristic to do so. Norms, regulations and societal awareness can greatly reduce phishing opportunities, but do not fully eliminate them. How can we ensure that we are not enticed into doing things that are not in our interests? The two authors could have found inspiration in Nassim Nicholas Taleb’s Antifragility: Things that Gain from Disorder (2012), in which he encourages us to proceed with the Eastern Orthodox Church’s apophatic theological tradition of the via negativa – that is, subtractive knowledge – as a shield against phishing. Omission (removal of drugs, cigarettes…) does not have side effects and undesired consequences. To summarise, Phishing for Phools is an entertaining book with valuable anecdotes and pieces of evidence on a subject every citizen should bear in mind, yet is not an indispensable read as most of its insights will probably sound extremely familiar. The reading will, however, prove useful as a vital reminder that capitalism in the twenty-first century is – more than ever – not a zero-sum game. Florian Bon graduated from a top French business-school – ESCP Europe – with a specialisation in Finance and is currently completing a Masters in International Economic Policy at SciencesPo Paris, while serving as an intern in the French High Council of Public Finance, an institutional body scrutinising the macroeconomic forecasts of the government and the trajectory of its public finances. Read more reviews by Florian Bon.